Six races into 2005 and Ferrari scored just 21 points so far. It's not quite as bad as 1980 when they scored five after six races and eight for the season, but it is one of the biggest downfalls in the team's history. When we compare the number of points after the first six races in one year to the first six in the next, Ferrari's fall is in fact unprecedented in Formula One history. Only on seven occasions was there a drop of over 30 points from one year to the next. Even when we look at all cases with the 2005 point system nobody comes close. What is interesting is that three of the seven cases happened within the last two years. Whether that's a result of the constant rule changes making development less straightforward and chances of a bad design bigger, remains to be seen. Both the 1980 Ferrari and 1966 Lotus downfalls came close to the dawn of a new era. For Ferrari it was the arrival of the turbo, although blaming it on that might be a bit far fetched in case of the 312T5 fiasco, while for Lotus it was the first year of the 3-litre engines in which they continued with their successful 1965 car. Nineteen years ago this week saw the Belgian Grand Prix, round five of the 1986 championship, taking place. After two consecutive victories McLaren driver Alain Prost had taken the lead, followed by Lotus' Ayrton Senna three points behind with 19. Nelson Piquet was third with 15, driving for Williams, while Prost's teammate Keke Rosberg was fourth with eleven points. McLaren's one-two in Monaco had put the team in the lead of the Championship, but with both Williams and Lotus within reach, the season was still very much open. When Formula One arrived in Spa for the Belgian Grand Prix, there was a gap in the entry list. Brabham started with only one car after Elio de Angelis was killed in testing at Paul Ricard. As a direct result the discussion about safety in Formula One started up and was the main focus during the Spa weekend. On Friday the first qualifying session surprisingly saw Gerhard Berger put the Benetton on provisional pole, a tenth ahead of Piquet. Behind the Brazilian the gaps were significant with number eight, Rene Arnoux's Ligier, no less than 2.8 seconds behind. Between Piquet and Arnoux it was Prost, Nigel Mansell (Williams), Senna, Ferrari's Michele Alboreto and Keke Rosberg. Saturday morning rain fell, but throughout the day the track dried and thus the final qualifying session was run in dry conditions. As Berger sat on the pitwall, the competition tried hard to beat his time. Prost came to within 0.040 seconds, Senna and Mansell to one tenth behind, but in the end only Nelson Piquet eclipsed Berger's time with a 1:54.331. The Austrian did go out for a final attempt, but went into his timed lap a few seconds after the flag dropped. The start on Sunday was chaotic. Berger started badly, while Senna and Prost made up ground. Three wide they headed for the La Source hairpin, where Prost on the inside ran out of room. The World Champion drove into Berger, making early pitstops necessary for both of them. In the chaos behind them, Lola driver Patrick Tambay hit Teo Fabi in the second Benetton. For Tambay the race was over, but Fabi could continue without even a pitstop. Piquet meanwhile didn't take much notice of what happened behind him. The Brazilian disappeared into the lead, with Senna and Mansell fighting behind him. That battle was lost by Mansell after five laps, who got Ferrari driver Stefan Johansson on his tail, who managed to pass the Briton on the same lap. By then Piquet was already nine seconds ahead and was starting to consolidate his lead. However, after 16 laps, just after Mansell found a way past Johansson again, it was suddenly over for Piquet as vibrations made driving impossible. Senna inherited the lead, with Mansell two seconds behind and Johansson in third, five seconds behind the leader. The rest of the field already looked beaten, with Alboreto 21 seconds behind in fourth, followed by Ligier drivers Arnoux and Laffite. Far behind them both Prost and Berger were driving superb races outside the points. Just after the halfway point the drivers pitted for fresh tyres. Mansell was the first of the leading trio to go in, followed by Senna and finally Johansson. When all are back on the track, top marks go to the Williams pit crew. Mansell has gained the lead. Senna returned in second, while Johansson fell behind his teammate Alboreto, who was on a non-stopper. With 17 laps to go the heat is on. Senna was three seconds behind Mansell and determined to catch the Williams. For four laps Senna charged hard, setting the fastest lap of the race and in rapid speed halved the gap after which Mansell replied. Very slowly the Williams gained a bit, but only with four laps to go the battle was won. At that time Senna let go, worried about tyre wear and fuel consumption. A few minutes later Mansell took the chequered flag five seconds ahead of Senna with the Ferraris in third and fourth, Johansson completing the podium. For the Scuderia it was the first time in the season that both cars finished the race. Fifth was Ligier's Jacques Laffite, while Alain Prost earned a hard fought sixth as the last car in the same lap as the winner. Three years earlier things ended a lot better for Nelson Piquet. In the European Grand Prix of 1983 the Brazilian scored his tenth victory on his way to the title. Coming to Brands Hatch for the 14th round of a 15 round championship, the battle was close. Renault driver Alain Prost was leading the championship with Ferrari driver Rene Arnoux only two points behind. In third Nelson Piquet in the Brabham was still within reach, five points adrift and even number four Patrick Tambay (Ferrari) wasn't completely out of the picture, eleven behind Prost with 18 points still to be won. 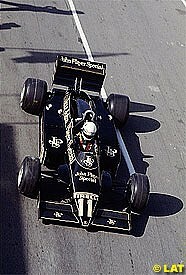 On Friday the provisional pole was grabbed by Lotus driver Elio de Angelis ahead of his teammate Nigel Mansell. After a season that consisted of nothing but downsides for the black and gold team, the Friday result came as a very pleasant change. Third was Piquet, three tenths behind de Angelis, but seven ahead of the rest. Prost was fourth and for Tambay in ninth the chances for the championship seemed to fade away. Piquet's teammate Riccardo Patrese came to within a tenth of de Angelis' Friday time, but the Lotus driver accelerated a bit more and took almost three tenths off his own time for Lotus' first pole since Zandvoort 1978. Of the frontrunners, Tambay was the only other driver to do a better time on Saturday. The Frenchman posted the sixth quickest time of the day. For Piquet it meant fourth on the grid, behind both Lotuses and his teammate. Both Ferraris were on the third row, while Prost was worst off from the championship candidates with an eight qualifying time. On Sunday it was Piquet's teammate Patrese who grabbed the lead at the start. Piquet himself held on to fourth with some disastrous starts behind him for both Ferrari drivers of which Renault's Eddie Cheever took profit. Manfred Winkelhock in the ATS jumped from ninth to sixth, ahead of Arnoux, Prost and Tambay. In the first three laps Mansell dropped from third to seventh. While Patrese and de Angelis fought for the lead, Piquet already was five seconds behind. However, what was more important was his two-second gap to Cheever and almost five to Prost. The Renaults were not attacking outright from the start. After eight laps Prost went past Cheever and on his way to Piquet, who had gotten a bit closer to Patrese and de Angelis. After eleven laps the two leaders clashed. As de Angelis tried to overtake, Patrese refused to make way. Both spun, handing Piquet the lead. Patrese recovered in second, but a bent suspension wasn't doing him much good. De Angelis dropped down to sixth behind Arnoux, but a lap later he was to abandon with an engine failure. Piquet immediately put the pedal to the metal, with Patrese covering his rear. In four laps time the Brazilian stroke a ten-second gap, after which Prost forced his way past Patrese and stopped the gap from growing. Until Prost's pitstop the gap didn't change. When the Renault driver pitted, Piquet started pushing with all he's got to make the gap as big as possible before his own stop. With a 43-second lead over Prost, the Brabham man drove into the pitlane. There a nightmare stop awaited him. A broken wrench almost doubled the length of his stop. However, his pushing paid off as he returned just as much ahead of Prost as before their pitstops. With a ten-second lead Piquet didn't have anything to fear for the remainder of the race. The only noteworthy change was the retirement of Patrick Tambay, who in the heat of his fight for third with Nigel Mansell suffered a brake failure and ended in the guardrail. When the chequered flag was waved, Piquet scored his tenth victory to keep his title hopes alive. Prost's second place kept the Frenchman in the lead, two ahead of Piquet. For Arnoux, who finished outside the points, and the retired Tambay the battle was over.